4.0 out of 5 based on 83 bloggers and 8 commenters. StylishTravel is a free blogger template with 2 columns, right sidebar, slider, social bookmarking icons, gradients and vectorial elements. 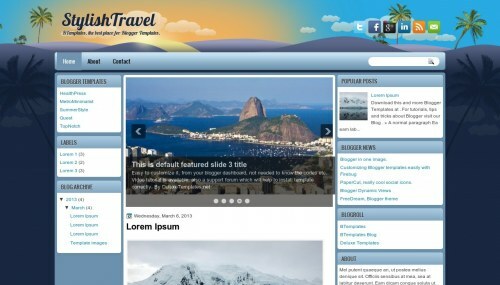 Excellent template for blogs about nature or travel. Hi, how do I make the middle column wider? It seems to be cutting off some of my photos.